Maximum Rate of Fire 550 r.p.m. 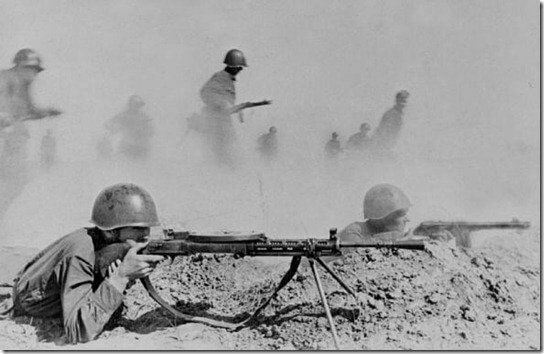 Notes The DP (Pulemyot Degtyaryova Pekhotny) was the standard light machine gun of the Russian infantry. It was issued to infantry platoons as a squad weapon and provided the rifle sections with their own fire support. It could only be issued with a pan magazine and this held 47 rounds. It had a few faults and these ranged from a flimsy bi-pod to problems with the recoil spring and these were addressed with a modified version named the DPM, this version fixed the issued found on the DP and had a pistol grip added, production switched to this version and it steadily replaced the DP. Both models were built in large numbers and remained in service even after world war two.